Orang Asli children during WASH programme. In commemoration of International World Indigenous People’s day, we explore the ongoing challenges of access to health for Indigenous communities. Drawing on an example from the Orang Asli community in Malaysia, we outline the potential entry points for overcoming some of the challenges, noting in particular the resilience and leadership of women in the communities. Globally, Indigenous people make up about 5% of the total population, but are also ~15% of the world’s extreme poor. Indigenous peoples are ethnically distinct, usually minority groups, who are recognised as belonging to a territory prior to colonial occupation or designation as a nation state. Compared to non-indigenous communities, health disparities remain stark. In most regions, their life expectancies are lower and they present with higher rates of malnutrition, chronic illnesses including diabetes, and higher reports of violence and injury, including self-harm and suicides. Many communities have been displaced having lost access and rights of use to land, which has been taken over for the purposes of development. Experiences of discrimination and poverty have resulted in poor utilisation of public services such as health and education facilities. These disparities are evident in countries worldwide regardless of national wealth and standards of available health services. In recognition of the loss of individual and collective human rights, the UN has set an essential, international standard in efforts to eliminate human rights violations, discrimination and marginalisation of the world’s Indigenous peoples. The UN also seeks to celebrate the achievements and contributions that Indigenous peoples make in the world, and to advocate for the promotion and protection of their rights. The Orang Asli (original people) make up 0.7% of the population in Peninsular Malaysia and 63% in East Malaysia. The Orang Asli face significantly poorer poor health outcomes than the majority, non-indigenous society. Between 2003 – 2007, infant mortality rate was estimated to be double the national figure. Among Orang Asli children, the prevalence and intensity of parasite infections remain high, up to 90% in some communities. These poor health outcomes are a consequence of complex interactions between socio-economic, living and working conditions. This is despite a raft of national government policies aimed at improving the quality of life for Orang Asli communities. A limited awareness of available health services, language barriers, and differing cultural practices are just some of the factors contributing to the problem of poor health in indigenous communities. As such, healthcare services are often poorly equipped to deal with treating patients from indigenous communities. In Malaysia, the local Orang Asli or ‘Original People’, are often viewed by authorities as ‘backward, ignorant and resistant to modern health services’, and therefore responsible for their poor state of health. Furthermore, healthcare professionals are often unaware of the cultural health beliefs and practices of indigenous groups, which can lead to ineffective and sometimes detrimental service delivery. Because of misaligned beliefs and visions, indigenous communities may display unresponsiveness, and even resistance, towards healthcare professionals. A lack of clean, easily accessible water is a problem for many Orang Asli communities. For those living in forests, water sources may be far away from settlements. This forces families, usually the women, to travel long distances to collect and carry back heavy pails of water. These challenges mean that water is treated as a precious resource – the same load of water is commonly used for washing clothes and then bathing. Some communities live on plantations where pesticides are commonly used. Despite this, water from open wells is used for household chores, cooking and drinking. The Global Peace Foundation, an international non-profit organization, has been working with several Orang Asli communities to address the issue of clean water. 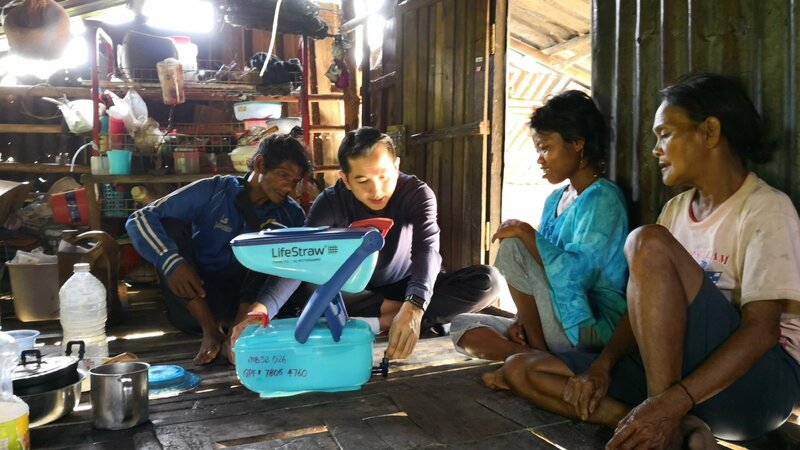 Dr. Teh Su Thye, CEO of the Malaysian office, said “the lack of clean water has resulted in health issues like skin and waterborne diseases, where many complain of skin rashes and itchiness on many parts of their bodies”. Diarrhoea is also common and has led to the hospitalisation of children. Over a series of observations, interviews and workshops, community members began to describe their water challenges to Dr Teh and his team. Problems of water scarcity, the absence of proper sanitation and poor hygiene habits were some of the concerns expressed by the Orang Asli community. These water-related health challenges were actively addressed by the Global Peace Foundation by implementing water, sanitation and hygiene (WASH) programmes. One such program is the Communities Unite for Purewater (CUP) initiative. It is a collaboration between the Global Peace Foundation and Orang Asli villages. Villages have been given easy to use water filters to make sure that everyone has access to clean water. This is combined with a fun, interactive community awareness session where people, mostly women and children, learn the importance of handwashing, how to do it properly and other key behaviours for good hygiene. Social Innovation for health works best when initiatives are created with communities and not just for communities. Taking the time to build relationships and trust is a vital part of any remedy to alleviate complex health and social problems. The work that the Global Peace Foundation Malaysia has done is an example of this. For programmes to be truly sustainable, they must be integrated into national health systems. This requires the combined efforts of the many actors involved from communities and NGOs, through to Ministries of Health and other policy makers. To bridge the gap between bottom-up initiatives and top-down policies, a shift in mentality must take place. The provision of public health services must be inclusive of and responsive to the needs of the Indigenous People, rather than one that reinforces the community’s dependency on the state. In truly ensuring that no one gets left behind, it is important that all health issues that are facing Indigenous Peoples are viewed from their point of view. ‘Health for all’ does not mean that solutions are ‘one size fits all’.